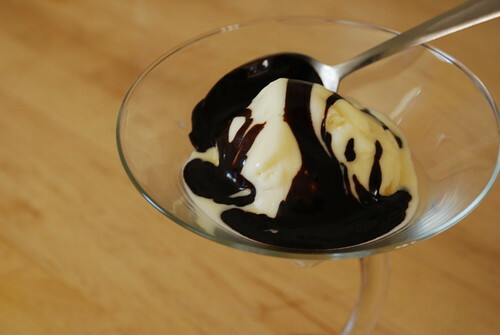 Recipe: Coffee Can Vanilla Custard Ice Cream | Dinner Love. 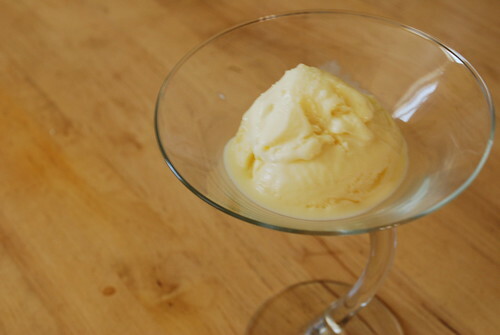 I love homemade ice cream. I also love to make ice cream, because I can do whatever I want, however I want, whenever I want. Peach ice cream? You got it! Chocolate custard? You betcha! Caramel swirl with m&ms, chocolate chips and peanuts? Why not? Dooooo iiiiiit. The only problem is that I don’t have an ice cream maker. I used to, but it was a cheapie one from Target and one day a few years ago it stopped working. I had it running for nearly eight hours before I realized that the little paddle inside wasn’t spinning, so the ice cream couldn’t become ice cream, just liquidy mess. It sucked. I hadn’t bothered to make ice cream since, because I thought you needed a proper ice cream freezer and I don’t have one. 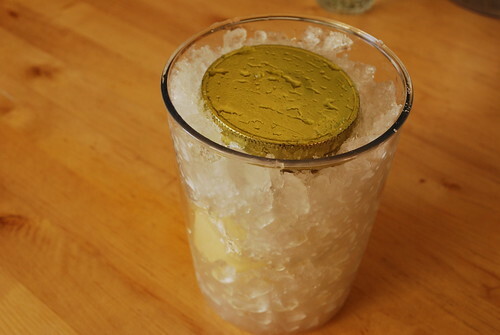 It turns out, you don’t need a freezer at all, just some ice and salt and ingenuity. These things I have in spades, which is why tonight I will have vanilla custard ice cream for dessert, and you can, too. Recipe from Fanny at Chez Panisse by Alice Waters. First you will need one very large jar and one small. The reason the recipe is called “coffee can” ice cream is because you are meant to use two coffee cans, but I don’t buy my coffee in cans. Jars or tupperware will work just as well. 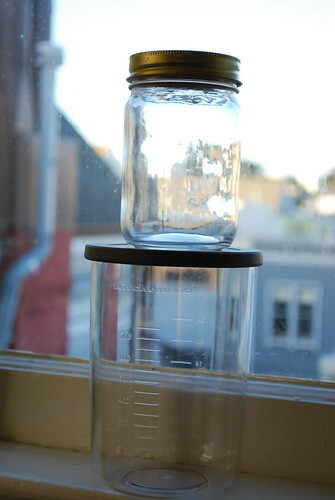 The small jar will hold the ice cream ingredients, and it needs to have a very tight seal. The large jar will hold the small jar, the ice, and the salt. 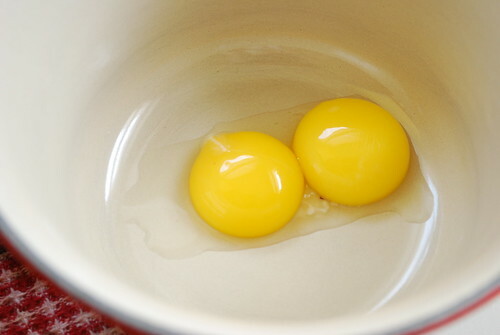 Separate the egg yolk from the white and put the yolk in a small saucepan. Add the sugar and whisk. Heat the milk (I used the microwave) until hot, but don’t let it boil. 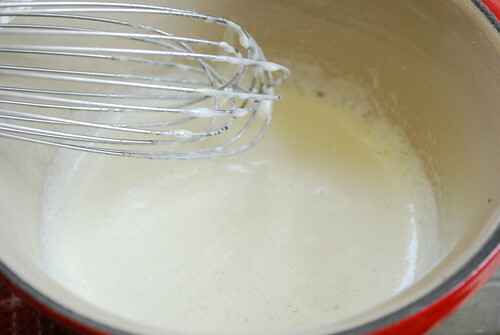 Slowly add the milk (about 1-2 TB at a time) to the yolk and sugar until completely combined. Heat gently, stirring all the time. 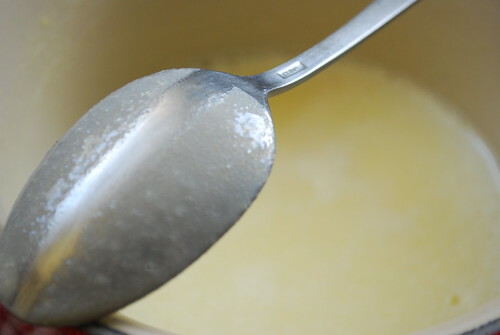 You want to thicken the mixture slightly, either until it reaches 170˚ or it coats the back of a metal spoon and you are able to draw a line through it with your finger. You are supposed to strain it at this point, but I didn’t. This did not negatively affect the finished product, but hey. If it makes you feel better, strain your custard. I don’t like to follow directions. Add the vanilla and the lemon zest and put the mixture into the fridge and allow it to cool. Once cool, stir in the cream and put the mixture in the little jar. If you wanted to add fruit or chocolate pieces to your ice cream, this would be the time to do it. 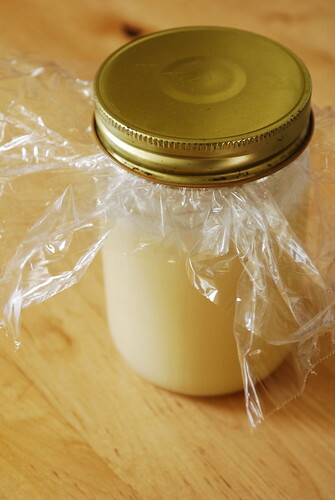 Put a piece of saran wrap between the jar and the lid. 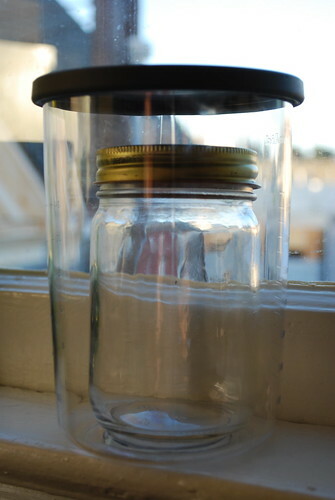 Put the jar in the freezer overnight, until it is frozen half solid. Take it out and pack it in the larger tupperware with ice and salt, and shake for about 20 minutes. If the ice cream is too soft for your liking, you can put it back in the freezer until it is more hard. Add chocolate fudge if you like. Hooray! Ice cream without a crazy ice cream freezer/maker/mabob. Oh yes! I used to do this whenever I was babysitting or nannying in college. The kids loved it!